Kulikov, Vladimir Vladimirovich (Doctor of Law). Video lecture is presented in the framework of the enlightenment project of the Presidential Library. BN Yeltsin "Video lecture" Knowledge of Russia. " I. Presidential Library. B. N. Yeltsin (St. Petersburg). 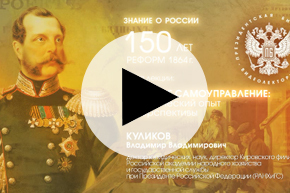 Project "Video lecture" Knowledge of Russia. "II The Boris Yeltsin Presidential Library Department of Educational Programs 1. Power (collection) 2. People (collection) 3. Electoral system in Russia: history and modernity (collection ) 4. Zemsky self-government - History - Russia - Multimedia publications 5. Video lectures.